Susan and Cathy are both Inspectors at Coconut Palms Beach Resort II (CP2) in New Smyrna Beach, Florida. This dynamic duo is being recognized for their dedication, team work and leadership. With a positive attitude and willingness to help, Susan and Cathy have been making the 65 mile trek each Friday and Saturday for over a year to help out at CP2’s sister property, Ocean Gates Resort (OGR), in St. Augustine, Florida. Clocking in 10-12 hour days to ensure rooms were turned on time with the highest quality, resulting in higher Customer Count scores and a very happy General Manager. Of the 78 deep cleans that CP2 completed in 2018, this Rockstar team did 52 of them. Each unit is personally inspected by the resorts General Manager/Assistant General Manager who are very hands on and do not miss a thing – all passed with flying colors! Susan and Cathy have established themselves as leaders and role models. 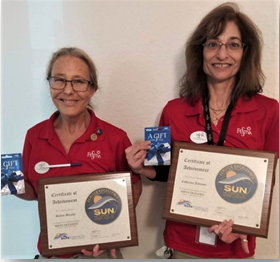 They train all new employees and have recently been designated as Sun Certified Trainers. They take the time to introduce new hires to their team members, resort staff and property management; making them feel welcomed and part of the team right from the beginning. This team spends a lot of time with initial training, providing the necessary tools to do a good job, as well as follow-up coaching and encouragement. Since they have been training, staff retention has improved. In addition, they have been instrumental in implementing procedures to reduce and eliminate guest leave behinds. Previously, regional inspections failed 5 out of 6 times with leave behinds. By pre-inspecting rooms, including opening all cabinets, drawers, couches, removing all cushions and making sure the Room Attendants leave everything open until final inspection, they have found a proven and effective method. Not only do current inspections pass with no leave behinds but through their positive attitude and passion for excellence, they have encouraged other Inspectors to follow suit. Always reliable, Susan and Cathy are strong leaders who lead by example. We are very proud to have them as part of the SUN family! 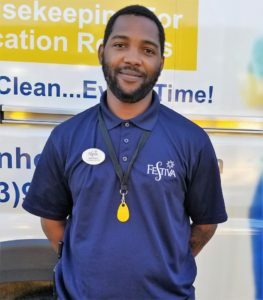 An Inspector at Bluewater Resort in Myrtle Beach, South Carolina, Mychal is being recognized for being a dedicated team player who takes initiative to get the job done. Always with a pleasant ‘can do’ attitude, Mychal goes above and beyond to ensure the success of his team. On several occasions he has traveled to our commercial laundry facility, Sun Linen Services, to assist making bins of linen and terry while drivers were out on deliveries. Being proactive, he’s made several trips to Sun Linen to pick up items needed for Bluewater, making sure the site is covered and runs smoothly. Additionally, when a battery needed replaced on the company’s GMC vehicle, Mychal didn’t hesitate to get his hands dirty and got the job done. Mychal really shines as he makes himself visible and available to help guests with their luggage and address any questions they have. Mychal’s willingness to go the extra mile to help with whatever needs to be done makes him a true asset to SUN. Elizabeth is a Room Attendant at Highlands at Sugar Mountain in Sugar Mountain, North Carolina. She is being recognized for consistently being a dedicated top performer and reliable team player. Elizabeth is exceptional at delivering a quality product on time. Always double checking her own work, she ensures the unit is stocked and the guest has everything they need. Taking great pride in her work, she always asks guests if they’re satisfied with their unit and offers her assistance for anything they need. Once her units are complete, she can be found taking on more units, helping her fellow teammates, or even assisting in the laundry. Having established trust among her colleagues, Elizabeth is often seen as a mentor for those in need of advice and assistance. She has a wonderful attitude that shines brightly, whether she’s helping her team or making a guest feel special. Elizabeth brings quality and a collaborative spirit; this is what truly makes her an asset to her team and the SUN family! Mary is a Laundry Supervisor at Coconut Palms Beach Resort II in New Smyrna Beach, Florida. 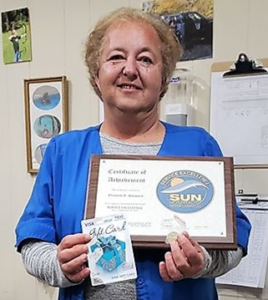 She is being recognized for her continuous dedication to improving process efficiency and productivity in the laundry department. Her efforts have resulted in decreased costs and increased savings in areas such as payroll and waste. In 2012, Mary assumed the struggling laundry facility and turned it into the well oiled machine that it is today. One spotlight moment for Mary was working countless hours to tackle a floor-to-ceiling pile of reworked linen. Her strong work ethic and dedication go above and beyond the call of duty. The now organized space has helped to improve productivity dramatically and room attendants can count on a quality finished product. Under Mary’s management, the laundry operation consistently passes all inspections. With only a few opportunities to interact with guests, she certainly makes an impression when she does. Mary has been recognized in guest comments for her excellent customer service. Mary has accomplished a lot in five years at SUN. Her boundless energy and positive attitude are truly inspiring. 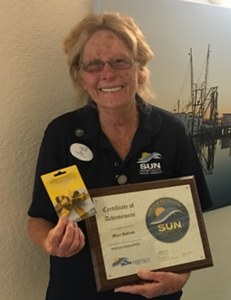 Mary is a true asset to her team and to the SUN family! 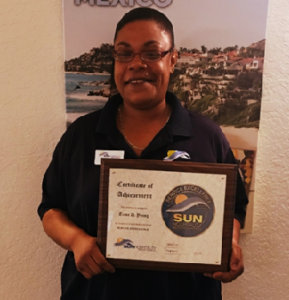 Tiana is an Inspector at Coconut Palms Beach Resort II in New Smyrna, Florida where she demonstrates outstanding customer service and quality work. As a supervisor and trainer, Tiana’s commitment to quality and professionalism is reflected in the high Unifocus scores she receives and the example she sets for her team members. Understanding the importance of delivering a superior product in a timely manner, she leads her team successfully in supporting Sun’s mission.